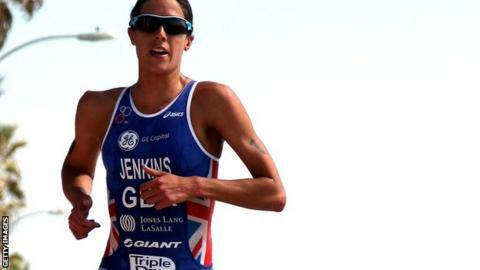 Welsh triathlete Helen Jenkins makes her World Series return in New Zealand on Sunday after 18 months out with the injury which ruined her 2012 Olympics. Jenkins won world gold in 2008 and 2011 but contemplated retirement when a back problem forced her down to fifth at the Games and did not subside for a year. The first of this year's eight-stage World Series, the Auckland leg is set in the heart of the city. "Auckland is a tough course - everyone thinks it's a really tough bike course," said Helen Jenkins. Jodie Stimpson said: "It'll be a fantastic race to watch. It also forms New Zealand and Australian selection for the Commonwealths so they'll all be trying to qualify. "That means, tactically, it's going to be good to be a part of. Everybody's there, really, apart from Non Stanford. It'll be an extraordinarily strong field to race against." "Retirement came into my head but a small part of you won't let you give up," the 30-year-old told BBC Sport. World silver medallist Jonny Brownlee heads the GB men's team in Auckland. Older brother Alistair Brownlee will rest his Achilles tendon and skip the event, which features leading Spanish duo Mario Mola and defending world champion Javier Gomez. Jenkins finished fourth in the smaller New Plymouth World Cup last weekend, her first competitive outing since London 2012, and admitted battling nerves. "I really enjoyed the race and there's relief that the first hurdle is out of the way," she said. "I wasn't sure what to expect and that was half of the nerves. I just felt rusty. "For the last few years, every race I've gone into I was aiming for the win. It's very different to go in thinking 'let's just see what happens'." Jenkins initially felt knee pain in May 2012 and could not shake the injury before the London Olympics. It was not until June 2013 that doctors traced the issue to a compressed disc in her back. She missed the whole of 2013 as a result. "It would have been good to have that diagnosis pre-Olympics because we could have numbed the pain for the Games and then got it sorted out straight away," she said. "Coming fifth at the Games took a lot for me, mentally. If the crowd weren't there, I would have come 25th. Looking back now, I'm proud of what I did." While Jenkins has named no specific goals in her comeback year beyond making the Wales team for the Commonwealth Games, the Bridgend athlete forms part of an exceptionally strong British squad for the World Series. She is joined by defending world champion and fellow Welsh triathlete Non Stanford, though the 25-year-old will miss the opening Auckland leg of the World Series with a foot injury. England's Jodie Stimpson, second behind Stanford in last year's world rankings, beat Jenkins to third place in New Plymouth last week. "I want to perform as well as I did last year," said Stimpson, 25, who starts among the favourites in Auckland. "The World Series is a very close second place to my main goal of the Commonwealth Games. "The last time Helen Jenkins was injured, she came back and became the world champion, so I wouldn't put anything past her. "She is an awesome athlete and she will get stronger and stronger with each race."